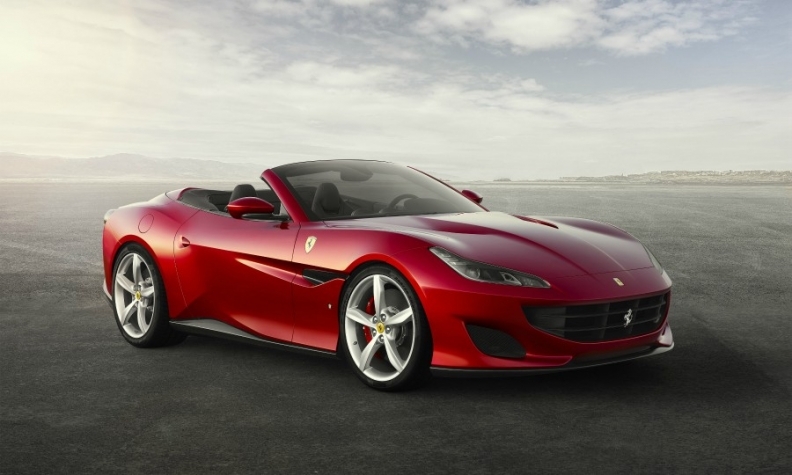 The Portofino led sales of Ferrari's V-8 models last month. MILAN -- Ferrari's sales mix leaned towards its "entry-level" Portofino supercar in the third quarter rather than its high-margin limited-edition models, weighing on the Italian company's earnings. Adjusted earnings before interest, tax, depreciation and amortization (EBITDA) for July-September period rose 4.7 percent to 278 million euros ($316 million). Sales were roughly flat at 838 million euros, the automaker said in a statement. The supercar maker, spun off from parent Fiat Chrysler Automobiles, has had a run of record earnings, helped by its higher-margin special edition models and a customizations program. Investors are looking for reassurance that new CEO Louis Camilleri can maintain Ferrari's strong growth achieved under late boss Sergio Marchionne, who more than doubled the value of the group since he took it public in 2015. Third-quarter results on Monday showed strong demand for the Portofino - an 8-cylinder entry level model priced at around $200,000 - and 12-cylinder models such as the 812 Superfast. But the higher shipments - up 11 percent - only partially offset lower volumes of the $2 million LaFerrari Aperta hybrid convertible that is finishing its limited series run. "The negative mix is driven to a great part by the success of the Portofino," Camilleri said. On a conference call with analysts, Camilleri said the negative impact from the model sales mix would be short lived, as the entry-level Portofino helped to attract new customers who "tend to become loyal to the brand, go up the range and eventually buy the special series or limited edition models." Shares in the luxury group closed down 1 percent. "Today’s results, while not spectacular, should be enough to keep bulls content as Ferrari continues to grow earnings despite higher investments and the benefits of the LaFerrari Aperta wearing off," Evercore ISI analyst George Galliers said. He said the stock remained a "relative safe haven" given uncertainties related to raw material costs, tariffs, China and pricing faced by other automakers. The third quarter is the second set of results presented by Camilleri, who took over in July after Marchionne's death. The sudden change at the top jolted shareholders who had expected Marchionne to remain at the helm until 2021. But investors welcomed a mid-term plan presented by Camilleri in September, under which he promised 15 new models, including hybrids, an SUV and special editions in a drive to almost double earnings to between 1.8 billion and 2 billion euros by 2022. Camilleri said on Monday two new models would be launched in the first half of next year, but declined to give more details. He said the company's order book remained "significant" and had expanded across all regions. Ferrari also had "considerable flexibility" to adjust to any potential trade issues, he added. Asked about any potential U.S. tariffs, Camilleri said these would have no material impact. "We would pass that on to our customers and we don't feel that would have a material impact," he said. He said China was still a single-digit market as a percentage of overall sales for Ferrari so its exposure was not as heavy as for other luxury product manufacturers. Ferrari kept its 2018 core earnings unchanged, disappointing some investors. Analysts said the move once again showed the new management was taking a more conservative approach than it had under Marchionne.